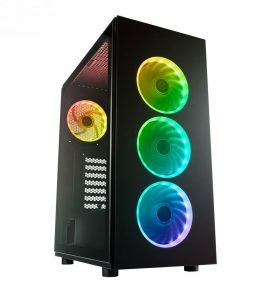 Taipei, Taiwan, January 29th, 2019 – FSP, a leading manufacturer of power supplies and PC equipment, is pleased to announce the availability of the CMT340 RGB PC Gaming case, the world’s smallest mid-tower chassis that can fit a 360 mm radiator. With four amazing looking and addressable RGB fans and two “galaxy dark” tempered glass panels, the CMT340 is a beautiful proposition for gamers on a budget. 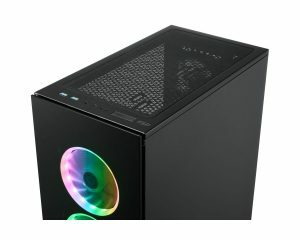 The CMT340 is a compact version of the award-winning CMT510 ATX mid-tower but with several improvements. It features a gorgeous black coated, sturdy SPCC steel frame, which holds the same distinctive features and flexibility as the one in the CMT510. It supports a wide variety of radiators, ranging from 120/140/240/360, for liquid cooling, or air cooling fans. The CMT340’s four RGB fans are fully addressable and compatible with ASRock Polychrome Sync, Asus Aura Sync, Gigabyte RGB Fusion, and MSI Mystic Light Sync. The CMT340 is engineered for gamers, its design is sleek, with flush transparent glass panels and straight edges to fit on the desk of every self-respecting gamer. The CMT340 is designed for gaming enthusiasts and allows a wide variety of cooling options. 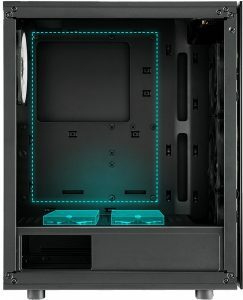 It fits a 360 mm radiator or three 120 mm fans at the front of the chassis, while a 240mm radiator, or two 120/140 mm fans, can be mounted at the top. It also fits CPU tower coolers as high as 160 mm and massive graphics cards up to 350 mm in length. Together with a PSU shroud, which has a cut-out, to display your power supply, the CMT340 becomes a compact case with spacious internal design that fits the needs of todays’ most demanding gamers. The FSP CMT340 is now available for 65,00€ without VAT.